This show ran from the time I was 6 years old until I was 8 years old. I loved all of the marionette shows while growing up. I used to watch Super Car, Fireball XL5, and Captain Scarlet too, but the Thunderbirds were my favorite. The Thunderbirds were a group 5 of specialized rocket ships, each one with a unique capability. All of these ships belonged to an organization that called itself International Rescue, which was based in the remote place of Tracy Island. Whenever a crisis occurred somewhere in the world a distress call would be sent out to International Rescue and the Thunderbirds would fly into action and save the day. Thunderbird 5 was an orbiting space station that functioned as an observation point and off world outpost. Thunderbird 4 was a mini sub for undersea missions. Thunderbird 3 was the rocket ship that could transport people between earth and the orbiting space station which again, was called Thunderbird 5. Thunderbird 1 was the lead rocket ship and would always report to the disaster area first to assess the situation and determine what equipment was needed to address the problem at hand. The real star of this show was the space ship Thunderbird 2. This behemoth had center pods or bays that could be interchanged in its belly. Back on Tracy Island this ship sat in a huge underground hangar. Whenever Thunderbird 2 was called to a mission it would be decided what kind of equipment would be needed to get the job done. Once that was decided a giant conveyor belt would start moving until the correct equipment pod was directly under the belly of Thunderbird 2. Thunderbird 2 would then descend down upon the selected mission pod by retracting its telescopic legs to lock it into place and then move out onto the runway. A hidden door would open up on the Island and Thunderbird 2 would emerge from its hidden cavern and coast towards a giant launch ramp. Once there the ramp would be tilted up towards the sky and Virgil Tracy would fire all thrusters to launch Thunderbird 2 into flight and head out for the mission. Once Thunderbird 2 got on the scene it would hover down into position. The telescopic legs would descend from the perimeter of its belly and they would come down until they touched the ground to support the weight of the ship. Once that was done, like an elevator the equipment pod would descend from its belly and come down until it touched the ground. On the front of the pod, a door that also functioned as ramp would open up and come down. After that a specialized rescue vehicle uniquely suited to the task at hand would emerge from the pod to come out and save the day. These vehicles were driven by one of the Tracy boys, and there were so many of them, but I do remember the mole, the motorized airplane landing pads, and the mini sub Thunderbird 4. 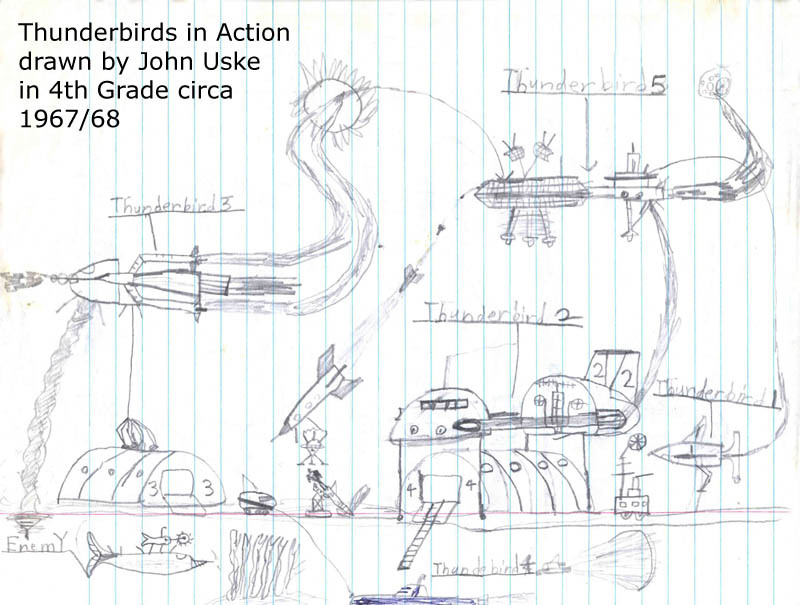 I used to draw lots of pictures of the Thunderbirds. Click on the Thumbnail at left to see one of them.